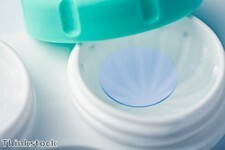 An innovative new type of coating presents the next step in the contact lens cleaning market, according to its creators, who claim that it can destroy the overwhelming majority of bacteria. Experts at Singapore's Nanyang Technological University (NTU) say the nanoporous antimicrobial coating is similar to a magnet in that it traps and then destroys 99 per cent of the bacteria and fungi that it comes across, Gizmag reported. It is already being used in the manufacture of contact lenses and its creators say it will change the way that both contacts and other products are rid of infections. Professor Mary Chan, from NTU's School of Chemical and Biomedical Engineering, said that the coating is effective against superbugs such as Pseudomonas aeruginosa and Staphylococcus aureus, in addition to sight-threatening fungi that cause corneal infections. "By developing novel materials which uses physical interaction to kill bacteria cells, we envisage this can be an alternative form of treatment for bacterial infections in the near future," she added.